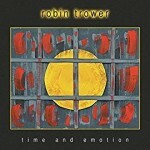 Share the post "Album review: ROBIN TROWER – Time And Emotion"
Imagine those moments when you are at the water’s edge as the tide comes in, and for a passing moment your footprint leaves a lasting impression as the waves recede. Robin Trower’s musical style is very much like that, except his guitar-led imprint has endured for decades. So to complete the metaphor, while his immediate footprint in the sand may be washed out to sea, his inner voice leaves a much deeper lasting impression. His sculptured guitar work and tonal colours are shaped by wah-wah squalls and when combined with a whispered husky vocal style he draws the listener in. A succession of ethereal moods gently washes over us and at their deepest point they resemble a psychedelic trance. From his first solo on ‘The Land Of Plenty’ and the atmospheric ‘What Was I Really Worth To You‘ to the doomy oppressive feel of ‘Try Love’ and the chiming book-ended title track, this could only be Robin Trower. There’s almost a sense of struggle in the way he digs deep for an emotional connection. His Knopfler style vocals and distorted tones makes for a hard fought musical journey which resolves itself with deeply wrought solos, lingering melodies and enveloping grooves. These essential layered elements are built on a subliminal undertow, in which every note conveys emotion and no inflection is wasted. This is a lovingly crafted work with a consistent emotional connection -hence the title – anchored by the twin pillars of tone and heartfelt lyrics. Trower has established an enduring legacy with a unique DNA in a 44 year solo career. Much like his mentor Jimi Hendrix, it’s discernible from the moment he launches himself into several dreamy atmospheric guitar-driven landscapes. His delicate touch and judicious use of tone, as well as his latter career world-weary vocals, stand out as a testament to his art. In many ways ‘Time And Emotion’ owes it’s impact to the context of its inception. For while Trower’s durability is predicated on the ground breaking ‘Bridge Of Sighs’, he has spent the last 7 years from ‘This Playful Heart’ onwards, honing a more reflective and introspective style. His use of aching tones, deep grooves and quasi-spiritual lyrics made his last album ‘Where Are You Going To’ a real joy. ‘Time And Emotion’ emulates that CD, in a coherent musical journey that demands patience, focus and unsurprisingly space and time. While in general terms the album owes much to his conversational style of guitar playing – he shifts from one note messages to enveloping moods – it’s his choice of notes, tonal emphasis, the languid string bends and expressive vibrato that serves him well. His additional judicious use of wah-wah, makes for the understated, but very potent way in which he enhances a melody. Trower’s guitar supports his voice with contrasting enveloping moods and feels, and then he further articulates himself through subtle dynamics, earthy tones and chord changes. On the muscular groove of ‘I’m Gone’, he momentarily slips into falsetto, on a riff driven percussive piece with a funky undertow that makes the best possible use of space and time to give the track real presence. What differentiates him from his contemporaries, is that all his essential elements come as a package. Even on the more minimalist John Fogerty influenced intro of ‘Bitten By The Snake’, the song gains impetus through contrast. There’s the ‘ying’ of the Spartan arrangement and the ‘yang’ of his coruscating wah-wah. He sets out his stall on the subtle tension building exercise of ‘What Was I Really Worth To You’, which he finally resolves with such taste and precision, that he’s almost in danger of revealing too much of his hand early on. But having established his ethereal canvas though intricate band interplay, he digs deeper on the album highlight ‘You’re The One’, which even after such a stellar career deserves its place at the top table. Everything flows seamlessly to this point and elevates the album on to another level. While his tone is richer and even more distorted, the song is neatly counter-weighted by drummer Chris Taggart’s lightness of touch. And this that sense of equilibrium that is writ large throughout this album. While Taggart and bassist Livingstone Brown nail the foundations, even a repeated annoying tambourine can’t distort his spectral canvas. He grooves on some notes and explores aching tones that come from another place to touch the soul. And when he finally dips into a straight blues on ‘Make Up Your Mind’, he employs nuanced restraint to keep us continually hanging on for the next note. It’s the music of an experienced hand who still has much to impart. This entry was posted in ALBUM REVIEWS, ALBUM REVIEWS (Mobile), All Posts and tagged album, Band Of Gypsys, blues, Chris Taggart, guitar, Jimi Hendrix, John Fogerty, Livingstone Brown, Mark Knopfler, Procol Harum, review, Robin Trower, rock, soul, Time And Emotion. Bookmark the permalink.